OAKLAND — The Packers held a 24-20 lead heading into the fourth quarter of Sunday’s game at O.co Coliseum. The Packers opened the second half with a possession that began at the 50-yard line. 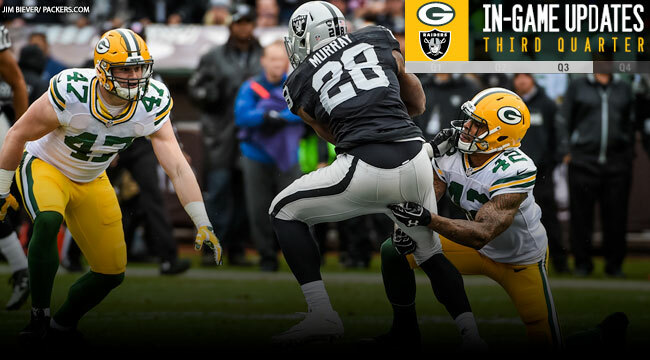 A fourth-and-2 pass interference penalty against the Raiders gave the Packers a first down at the Raiders 14. On third-and-2 from the 6, Aaron Rodgers’ pass went through Jeff Janis’ hands. Mason Crosby kicked a 24-yard field goal for a 17-13 lead with 10:18 to play in the third quarter. Derek Carr followed with a 41-yard bomb to Amari Cooper at the Green Bay 40. The Raiders faced a fourth-and-1 at the 31. Latavius Murray exploded up the middle for 3 yards. Two plays later, Carr threw a 26-yard touchdown pass to Cooper and the Raiders led, 20-17, with 6:48 to play in the quarter. Jeff Janis returned the ensuing kickoff 47 yards, and the Packers were in business. Jared Abbrederis caught a pass over the middle for 15 yards. Rodgers followed with an 8-yard toss to James Jones at the 30, and then Jones caught a perfectly thrown pass for six. With 5:46 to play, the Packers led, 24-20.